Several years ago, I was just about to make a portable shooting bench, when I came across a small ad in Shooting Times. Rick Jamison had made plans for a bench that looked just about like what I wanted and I was open to any ideas that might improve my project. The design was so good that I used his instructions almost to the letter. The total cost of the project was about $75. and I had enough extra material to make a shooting stool. This is an extremely stable bench to shoot from and it weighs 55 pounds. 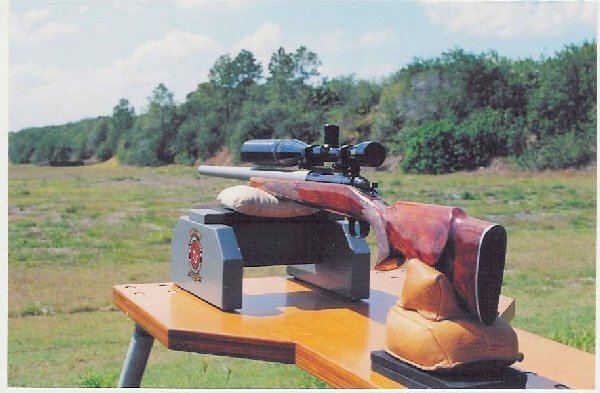 Using this solid shooting bench makes precision shooting considerably easier. I did make a few improvements on this project that were well worth the extra work. The table top measures 27" x 36" and is made from (2) pieces of 3/4" grade 1 plywood, glued together. I recessed the bolt heads in the table top so that they wouldn't snag anything that might slide across the surface. The (3) legs are 31" long, made from heavy 1.5" diameter galvenized steel pipe. 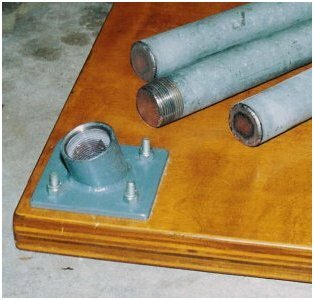 Each leg is screwed into a galvenized pipe coupling that is welded in the center of a 4" x 4" x 1/4" steel mounting plate. These pipe couplings are positioned so that the legs are angled (at 18 degrees) tilting away from the center of the table. After testing this bench a few times, I welded a cap on the end of the legs so that they wouldn't dig into the ground like cookie cutters. In Florida sand, that's a major improvement. Without this upgrade your bench would slowly become a little shorter as the day goes on and the legs would get filled with dirt. Except for a concrete shooting table, this portable bench is about as solid as anything you could ever hope to find.